Mae ein swyddfeydd ar gau ar ôl heddiw tan 2 Ionawr, mwynhewch y gwyliau a ‘da ni’n edrych ymlaen at eich gweld yn 2018! Our offices are closed after today until 2 January, have a great break everyone and we look forward to seeing you in 2018! Stand out projects focusing on UK wildflowers have until mid January 2018 to apply for grants of £2,000 or £4,000 to transform local spaces. Grow Wild UK awards funding for projects that brings people together through activities that connect their community and celebrate UK native wildflowers, plants and/or fungi. The Fund is a partnership between Grow Wild UK, the Royal Botanical Gardens at Kew and Lemos&Crane. Focus on UK native wildflowers, plants and/or fungi, highlighting the importance of these species for the environment, and for quality of life. Engage one or more of these groups: young people aged 12-18, students and young people aged 18-25, people living in urban areas, people experiencing hardship and reduced access to services, adults that are less engaged with their community and environmental activities. Encourage large-scale community involvement, ideally in the hundreds. Deliver the project in a space or location that is accessible to the general public. Be delivered by voluntary, youth or community groups that are constituted, not-for-profit, or charitable. This includes youth groups, secondary schools, councils and health authorities. It is estimated that the fund will support 50 groups across England, Scotland, Wales and Northern Ireland in 2018. The Woman to Woman Fund, created by Rosa with funding from the Tampon Tax Fund, is inviting applications for its third and final funding round in the UK. The Woman to Woman Fund, established by Rosa, supports charitable women’s sector organisations with an annual income of less than £100,000. It is targeted at projects that address the critical needs of women and girls in the UK. For its third and final call for applications, and in celebration of the centenary of the women’s vote, this funding round will have a renewed focus on leadership and representation. Address the critical needs of women and girls that miss out the most, including: marginalised populations, BME women, lesbian, bisexual or transgender women and girls, women and girls with disabilities, older women, homeless women, survivors of gender violence, women in prison and ex-offenders, and other underserved and disadvantaged groups of women. Operate in less economically resilient towns, cities and rural areas within the UK. The Fund is particularly interested in work that increases women’s representation, skills building and civic engagement. The deadline for applications is 25 January 2018 (5pm). Charities in the UK that are seeking funding for their work with disadvantaged children and young people aged 18 years and younger can start the application process for funding in 2018. The BBC Children in Need Small Grants programme will consider applications requesting grants of up to £10,000 to support projects for up to three years. Organisations must be working to combat this disadvantage and make a real difference to children and young people’s lives. There are four deadlines in 2018: 1 March 2018, 13 May 2018, 2 September 2018 and 2 December 2018 (midnight). Communities in need are set to benefit from Greggs Foundation funding aimed at health and social welfare issues in England, Scotland and Wales. The Greggs Foundation's Community Projects Fund is inviting applications for grants of up to £2,000 to not-for-profit organisations across Great Britain. Funding will support projects or equipment for those in need at the heart of local communities. The Local Community Projects Fund is administered by seven charity committees throughout Great Britain. Please note that the programme is 'highly over-subscribed' and there is 'huge competition' for the grants available. The next deadline for applications is 9 March 2018. Using money from the 5p levy on carrier bag sales in Greggs shops, the Greggs Foundation's Environmental Grants scheme aims to improve people’s lives in Great Britain. The Gregg's Foundation's Environmental Grants programme is now inviting applications for grants of up to £2,000 for projects in England, Wales or Scotland that deliver a real benefit to the environment. Insuring involvement of local communities. Delivering a sustainable and measurable difference. The funding can be used to cover the purchase of equipment, sessional salary costs, purchase of trees/plants, small capital projects and learning activities. Not-for-profit organisations with a turnover of £300,000 or less as well as schools in England, Scotland and Wales can apply. Organisations that are based near Greggs shops will be given priority. Calor are proud to support projects in your local rural community. What is the Calor Rural Community Fund? Calor offers grants of up to £5,000 for projects that will provide an on-going service for local communities, and many rural communities and projects off the mains gas grid have submitted projects for funding and then encouraged people to vote for them. The 10 projects in each category that received the most public votes were shortlisted as finalists and then reviewed by a panel of judges, who have now selected the 9 winning projects for funding. Applications should be for £1million or more and be from organisations that can deliver impact across their chosen category and across multiple regions in one or more of England, Scotland, Wales and Northern Ireland. ● general programme (for which we have identified a number of sub-themes). Funding available to Sports groups ! A wyddoch chi fod llawer o arianwyr eisiau cefnogi elusennau a mentrau cymdeithasol i ddatblygu gwasanaethau digidol? Mae CAST (y Ganolfan ar gyfer Cyflymu Technoleg Gymdeithasol) eisiau sicrhau bod sefydliadau’r trydydd sector yn barod i achub ar y cyfleoedd hyn. Dewch i’n digwyddiad rhad ac am ddim, a gynhelir gan CAST, i ddysgu sut i gyflwyno cynnig gwych i ariannwr perthnasol er mwyn helpu i wireddu eich uchelgeisiau digidol. Bydd y sesiwn am ddim hon yn para tair awr ac yn cymysgu archwilio creadigol â phwyslais ar gyflwyno cynigion arbennig i gronfeydd perthnasol. Gallwn gyflwyno elusennau a mentrau cymdeithasol i bartneriaid digidol gwych, a defnyddio ein profiad o weithio gyda rhoddwyr grant digidol i amlygu meysydd diddordeb/potensial. Did you know that many funders are actively looking to support charities and social enterprises to develop digital services? CAST (the Centre for Acceleration of Social Technology) wants to make sure that third sector organisations are ready to take advantage of these opportunities. Come along to our free event and learn how to submit a great proposal to a relevant funder which could help bring your digital ambitions to life. This three hour session will mix creative exploration of digital development opportunities with a focus on submitting funding proposals. CAST can also use their expertise to identify areas of interest or potential and make introductions to great digital partners for those charities and social enterprises who need it. Please see below the “Natural Resources Wales’ First Open Call for projects under the new Commissioning Approach” links to our Web Site. If you follow the link it will take you to EOI form and the Guidance note. The FAQ document will be updated on the Web periodically, please check the link regularly. The guidance document has all the relevant contacts in case of enquiry. All EOI forms must be submitted by 23:59 on Sunday 14th January 2018 to FundingApplication@cyfoethnaturiolcymru.gov.uk . 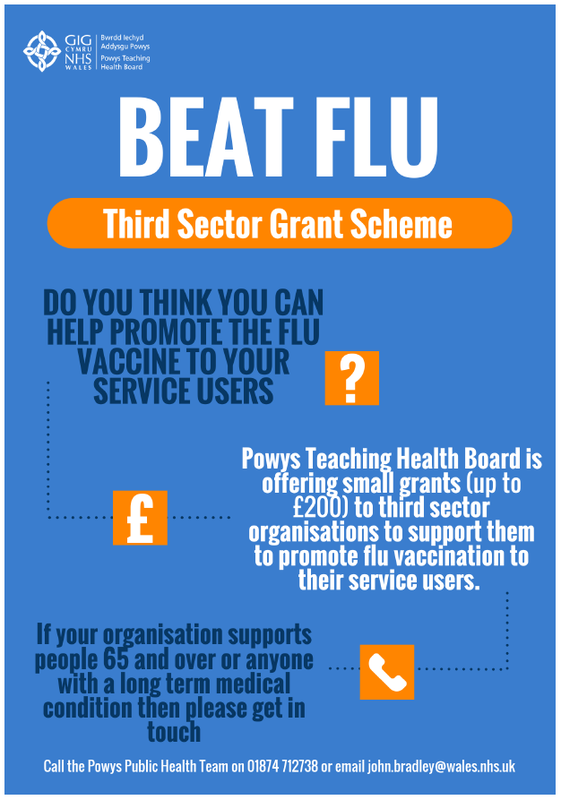 'Powys Teaching Health Board is offering small grants (up to £200) to third sector organisations to support them to promote flu vaccinations to their service users. Do you think you can help promote the flu vaccine to your services users? Grants for voluntary organisations in Wales in support of sport, the arts, the community and the environment. Through its funding, the Trust aims to improve the quality of life of people who live and work in Wales. In particular, the Trust aims to promote education, history, language, culture, music and folklore particularly for those who face discrimination or disadvantage. Local Organisations - Awards of up to £2,500 are available for organisations with a remit to serve their local community or town. Regional Organisations - Awards of up to £7,500 are available for organisations with a remit to cover a region or local authority-wide area of Wales, ie Powys or North East Wales. Match funding is not a requirement, but applicants should have demonstrated what other sources of funding have been sought and secured. Voluntary groups working with local authorities (applicants cannot be the local authority). Priority is given to organisations serving groups and communities suffering from the greatest disadvantage. Projects that seek to redistribute grant funds for the benefit of third party organisations. Applications made solely in the name of a local authority. Successful applicants may not reapply to the Trust until a three year period from the date of grant offer has elapsed. Sport embraces much more than traditional team games and competition. Sport can mean physical activity or the improvement of physical fitness and mental well-being, and can assist in the formation of social relationships and individual and team confidence. The Trust is particularly interested in supporting projects that improve the quality of life of people and communities facing disadvantage. The Trust strives to make a difference to sporting organisations and those organisations delivering sports projects throughout Wales and appreciates that sport relies heavily on volunteers. The Trust is keen to support volunteer-based projects, particularly from ethnic minorities and people with disabilities. In addition, the Trust recognises the difference that coaching can make to the development of a sport and is keen to fund equipment and coaching costs if the need has been clearly identified. The Trust is keen to support arts projects that are creative, unique and work with the disadvantaged or deprived individuals and groups throughout Wales. The Trust wishes to develop and improve knowledge and practice of the arts and to increase opportunities for people to see and participate in the arts. The Trust aims to give more people the opportunity to enjoy the diversity of performing and visual arts in Wales. The Trust particularly favours proposals which expand and improve arts provision in parts of the country less well served than others and will give priority to organisations which strive to work together to share experiences, practices and ideas. The Trust welcomes applications from environmental groups from both rural and urban areas in Wales, recognising the dramatically different landscapes across Wales. The Trust encourages applications relating to recycling, developing green spaces, the development and promotion of green practices and the promotion of public transport schemes. Projects that improve the quality of Wales' environment, protect and create a vibrant countryside, and develop and promote sustainable land use planning will be a priority for support. The Trust aims to fund programmes that protect and enhance Wales' natural heritage and promote its sustainable use and enjoyment in a way which contributes to local economic prosperity and social inclusion. The Trust is keen to target local communities suffering from the greatest disadvantage. The Trust will give priority to organisations that are looking to tackle social, personal, economic or cultural barriers within their own communities. In particular, projects that lead to greater independence and give people more control over their lives will be given priority. The Trust welcomes applications that give people a voice to express their needs and hopes. The Trust is keen to help disabled people to challenge barriers and to be active and visible in their local communities. The deadline for Local Grant applications is 18 December 2017 (noon). Information on the next application round for Regional Grants will be provided when it becomes available. Application forms are available to download from the Trust's website. Rydym yn lansio rhaglen ariannu newydd o’r enw Helpu Teuluoedd sy’n Gweithio yng Nghanolfan Gymunedol Butetown, Caerdydd, ddydd Mercher yma. Bydd y lansiad yn dechrau am 13.00 ac mae tocynnau ar gael ar-lein yma: https://goo.gl/KWXTup.Hefyd, bydd digwyddiad bwrdd crwn yn Y Rhyl ar 1 Rhagfyr i siarad trwy’r rhaglen newydd gyda’n swyddogion ariannu https://goo.gl/KqjMGb.Bydd Helpu Teuluoedd sy’n Gweithio’n darparu ariannu ar gyfer prosiect sydd wedi’u heffeithio gan dlodi ‘tra’n gweithio’. Rydym yn cydnabod bod nifer cynyddol o bobl yng Nghymru sydd wedi’u heffeithio gan dlodi, er gwaetha’r ffaith eu bod yn gweithio. Rydym yn disgwyl i’r gronfa helpu aelwydydd gydag o leiaf un person sydd â swydd amser llawn neu ran-amser neu sy’n hunangyflogedig ac yn magu o leiaf un plentyn o dan 18 oed.Mae’r rhaglen ariannu newydd yn ymgymryd â rôl weithredol wrth annog prosiectau i ennyn diddordeb pobl trwy gynnig model gwahanol ar gyfer y gronfa hon. Rydym eisiau gweld bod y bobl a fydd yn defnyddio’r gwasanaeth yn gweithio mewn partneriaeth gyfartal gyda’r bobl sy’n ei ddarparu.Bydd manylion llawn y rhaglen newydd a sut i ymgeisio ar gael ar wefan y Gronfa Loteri Fawr o 22 Tachwedd 2017. Rhaid i ffurflenni cais wedi’u cwblhau fod gyda ni erbyn hanner dydd ar 15 Mawrth 2018 a bydd y prosiectau llwyddiannus yn cael eu hysbysu ym mis Gorffennaf 2018. We are launching a new funding programme called Helping Working Families at the Butetown Community Centre, Cardiff this Wednesday. The launch will begin at 13.00 and tickets are available online here: https://goo.gl/KWXTupThere will also be a round table event in Rhyl on 1 December to talk through the new programme with our funding officers https://goo.gl/KqjMGb . Helping Working Families will provide funding for families affected by ‘in-work’ poverty. We recognise that there are a growing number of people in Wales who are affected by poverty, even though they are in work. We expect the fund to help households where at least one person has a full or part time job, is self employed and supporting at least one child under 18. The new funding programme is taking an active role in encouraging projects to engage with the people by offering a different model for this fund. We want to see that the people who will use the service working in an equal partnership with the people who provide it. Full details of the new programme and how to apply will be available on the Big Lottery Fund website from 22 November 2017. Completed application forms should be with us by midday on 15 March 2018 and successful projects will get the go ahead in July 2018. Yn ystod y flwyddyn ddiwethaf, mae Cyfoeth Naturiol Cymru wedi bod yn datblygu dull newydd o gomisiynu i glustnodi’r heriau, fel y’u nodir yn y Cynllun Adnoddau Naturiol, yr Adroddiad ar Sefyllfa Adnoddau Naturiol (SONARR) a Datganiadau Ardal a Llesiant, y mae angen inni fynd i’r afael â hwy drwy gydweithio â’n gilydd. Fel rhan o’r dull hwn, bydd cyllid a chymorth arall yn cael eu neilltuo i heriau ym mhob un o’r ardaloedd sy’n destun Datganiadau Ardal Cymru ac i gamau sydd yn well eu gweithredu unwaith yng Nghymru. Rydym yn cynnal cyfres o ddigwyddiadau i gyflwyno’r heriau ac i lansio galwad am fynegiannau o ddiddordeb. Bydd 3 digwyddiad ledled Cymru a gweminar (dydd Mawrth 5 Rhagfyr) i’r sefydliadau hynny na fydd yn gallu mynychu’r digwyddiadau a gynigir. Bydd y sesiynau hyn yn cynnwys trosolwg o dirlun deddfwriaethol newydd Amgylchedd Cymru; yr heriau a nododd Cyfoeth Naturiol Cymru y gellir eu datrys yn unig mewn cydweithrediad â phartneriaid allanol; eglurhad o’r broses ymgeisio; a sesiwn holi ac ateb. Mae nifer y lleoedd yn gyfyngedig ac felly 2 gynrychiolydd ar y mwyaf o bob sefydliad a all fynychu. Over the past year, NRW has been developing a new commissioning approach to identify the challenges, as set out in the Natural Resource Plan, the State of Natural Resources Report (SONARR) and Area and Wellbeing statements, that we need to work in collaboration to address. As part of this approach, funding and other support will be allocated to challenges in each of the areas covered by Wales’ Area Statements and to actions that are best delivered once for Wales. We are holding a series of events to introduce the challenges and launch a call for expressions of interest. There will be 3 events across Wales and a webinar (Tuesday 5th December) for those organisations unable to attend the events on offer. These sessions will include an overview of the new legislative landscape of the Welsh Environment; the challenges that NRW has identified that it can only solve in collaboration with external partners; an explanation of the application process; and a session for questions and answers. There is a limited number of places available and therefore a maximum of 2 representatives per organisation may attend. The Community Facilities Programme is a capital grant scheme and can be used to improve community facilities which are useful to, and well used by, people in the community. Grants are available at two levels; small grants of under £25,000 and larger grants of up to £250,000. The Programme is open to community and voluntary sector organisations, including social enterprises. The focus of the Programme is on increasing opportunity, creating prosperity for all and developing resilient communities where people are engaged and empowered. All applicants are expected to work with partners which can come from the public, private or the third sectors. Priority will be given to applications from former Communities First cluster areas but applications from other areas will also be welcome and we expect to fund the best of these. Mae grantiau ar gael ar ddwy lefel: grantiau bach o dan£25,000 a grantiau mwy o faint hyd at £250,000. The Henry Smith Charity distributes over £28 million a year in grant programmes designed to reduce social and economic disadvantage in the UK. Following a review of its grant procedures, the Funder has refined its Main Grant programmes, separating it into two defined funds under the same new strategy that aims to work with people for whom other sources of support have failed, been inappropriate or are simply not available. Increasing resilience - empowering people, encouraging integration and personal independence, helping people to recover and move on. Creating opportunities and life chances - raising aspiration, equipping people with new skills, unlocking and enabling potential, and providing the means to improve life circumstances. Empowering communities - strengthening and connecting communities and making people feel valued, providing opportunities for social connections and relationships, encouraging participation and inclusion. The Main Grants: Improving Lives Fund is the largest of the Charity’s funds, and will support the work of established charitable organisations with incomes of up to £2 million. Funding is available for projects that help people when other sources of support have failed, are inappropriate, or are simply not available. The Main Grants: Strengthening Communities Fund is designed to support small charitable organisations working at grassroots level in the most disadvantaged areas of the UK. The County Grants programme provides grants for smaller organisations working with disadvantaged people and communities in one of eight English counties. Groups should note that funding for Surrey is not available until early 2018. The Holiday Grants for Children programme provides grants for recreational trips and holidays for groups of children aged 13 and under in the UK who are disabled or disadvantaged. These are one-off short grants. The Christian Projects grant programme awards grants to projects that explicitly promote the Christian faith in the UK. Grant sizes are generally between £10,000 and £60,000 and are for charities and not-for-profit organisations, including social enterprises that are based and working in the UK. There are no deadlines. Applications are considered on a regular basis, depending on the fund applied to.